one of the best, if not THE best, female singer/songwriters out there today. 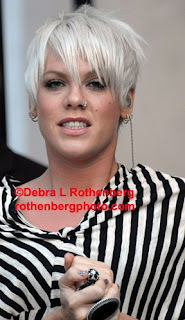 Pink rocked up the CBS Early Show today on a beautiful day. 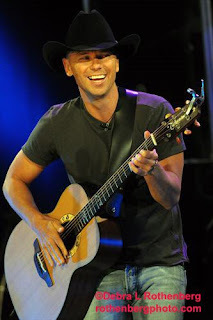 I have never been a fan of the color pink, but I love this singer. Her words, music and message are all great. Lauren Conrad signs autographs for fans at the David Letterman Show. On the set of "Ugly Betty" in Gramercy Park. America Ferrera's transformation is amazing. My heart goes out to this very talented woman. She is at the top of her craft, newly engaged, and this tragedy happens. Missing 7-year-old Julian King in a photo released by police. Jennifer Hudson endured more heartbreak Monday when she identified the body of her 7-year-old nephew - found shot to death in an SUV - at the Chicago city morgue. The Oscar-winning actress and singer, who grew up in the Windy City, journeyed to the coroner's office, where the body of little Julian King lay on a gurney covered with a white sheet. "Yes, that is him," Hudson said quietly when she saw the boy's face on a video screen, said Sean Howard, a spokesman for the Cook County medical examiner's office. For Hudson, whose mother and brother were found slain Friday, it brought the devastating death toll in her family to three. Still, she did not buckle under the grief: "She was just brilliant and strong," Howard said. "Her last words to me were, 'Just tell the general public once again to respect my family's privacy.'" Hudson said her faith in Jesus Christ "was going to get her through that," Howard said. "Those were her words." As she left the facility, Hudson's bodyguards held umbrellas to hide her anguish. Nobody has been charged with the murders, but cops are holding William (Flex) Balfour, 27, the estranged husband of Hudson's sister Julia, at a state prison for a parole violation. "We're following any lead we can get right now," said city Police Superintendent Jody Weis. The Chicago Sun-Times reported Julian had been shot once in the head and was dressed in basketball shorts and a stained white T-shirt. Julian vanished Friday from his home on the gritty South Side after Hudson's mom, Darnell Donerson, 57, and brother Jason Hudson, 29, were gunned down. 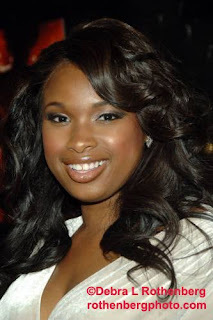 Jennifer Hudson, 27, who won an Oscar for her role in "Dreamgirls," and had remained tight with her family, immediately flew home and offered a $100,000 reward for information leading to Julian's safe return. The hope that he was still alive was dashed Monday morning when Julian was found on the floor of a Chevy Suburban truck that had belonged to his murdered uncle. Balfour, Julian's stepdad, has a long rap sheet: He has spent nearly seven years behind bars for attempted murder, vehicle hijacking and possession of a stolen vehicle. Out on parole, he was shacked up with another woman in a violent, drug-infested neighborhood on the West Side of Chicago near where Julian was found. "He's like a cool little cat," an upstairs neighbor of Balfour's girlfriend said of the ex-con. It was a dog walker who spotted the suspicious truck and called the cops, and it matched the one sought in an Amber Alert issued after Friday's double murder. As police searched weed-strewn vacant lots and alleys, neighbors said they noticed the truck Sunday. "I'd seen it out there three or four times Monday," one woman, who would not give her name, said. She could not explain why she didn't call police. 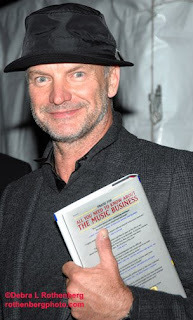 caught carrying the book "All You Need To Know About The Music Business." I don't think Sting needs this book-seems he already knows all there is to know about the business he succeeds at so very well. 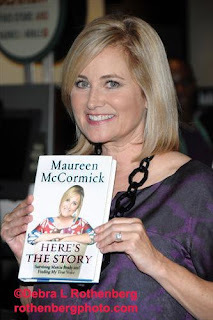 Maureen McCormick, tv's "Marcia Brady" from "The Brady Bunch" signs copies of her new tell all book "Here's The Story"
another busy day, just the way I like it. Some great shoots, some not so great shoots, "stolen moments" where, when walking from one assignment to the next, I spot someone on the street. 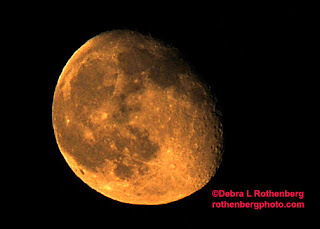 What I really wanted to do was head down to Philadelphia with my friend Debbie and try and find my Philadephian photographer friend Hugh and shoot the Obama rally where Bruce Springsteen was performing an acoustic set. Turns out my good friend and Sorority Sister Dara was there and even met someone I knew. However, I took several assignments for today several weeks ago, before the rally was announced, so I was out of luck. 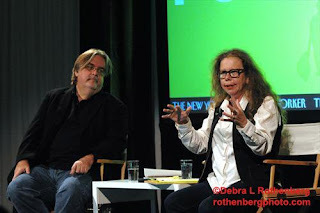 The New Yorker Festival was all weekend and my agency, Startraksphoto, are the house photographers.For the second year in a row, I was assigned to shoot a conversation with Matt Groening (creator of the Simpsons) and Lynda Barry. Hysterical is too calm a word for this pair. 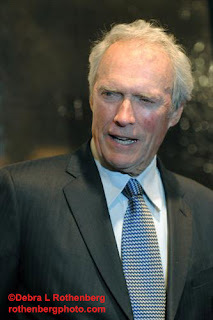 A few more events for the festival and then it was off to the Ziegfield Theater for the big premiere of the fall-"The Changeling" starring Angelina Jolie and directed by Clint Eastwood. Damion Stene from NBC/Universal is probably the best Publicity person this city has ever seen. 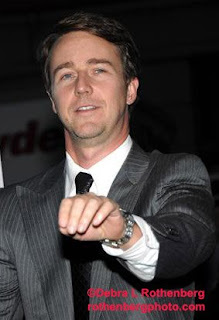 He sends out an email informing everyone of an upcoming premiere and sends us an email back with our number depening on how fast we responded. He tells us what time to arrive-about an hour before the screening is to begin, we head into the tent in our assigned order, and take out positions. He also ALWAYS gives us a lot of space. Last night, there were about 20 photographers who were not credentialed but space was made for them outside the tent. 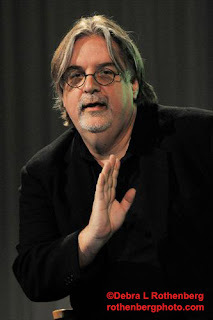 IF EVERYONE PR person in NYC handled events like Mr. Stene does, it would be wonderful. 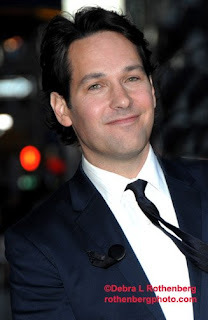 This man is a gem. Nothing brings out more photographers, fans and video than an Angelina Jolie premiere. Even photographers based in LA fly out. West 54th Street was a parking lot. Much to the delight of the fans, Angelina and Brad Pitt signed autographs for what seemed to be an eternity. Finally, into the tent they arrived, arm in arm. Flashes were blinding and a constant.Then all of a sudden, they were gone. The group started chanting "fashion, fashion" hoping she would some back and pose alone. Several never thought she would, but alas-there she was...back on the carpet posing alone. When she was done, the cheers and clapping and loud "Thank you, thank you" could probably be heard to 6th Avenue. These are the rare moments-when EVERYONE shooting is completely happy. 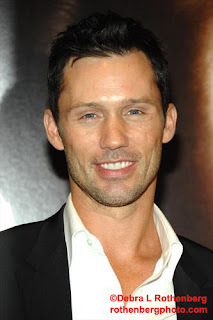 Clint Eastwood also walked the carpet as well as Jeffrey Donovan-Diane, my good friend and Sorority Sister-his smile is for you! "Stolen moments" of the day-spotting Anne Hathaway (and reacting so fast I didn't even notice she was holding some woman's hand) and comedians Sarah Silverman and Jimmy Kimmel who are back together as a couple after breaking up. A few fans asked Sarah for a photo and she was more than happy to stop.